The Galileo board is also software-compatible with the Arduino Software Development Environment, which makes getting started a snap. 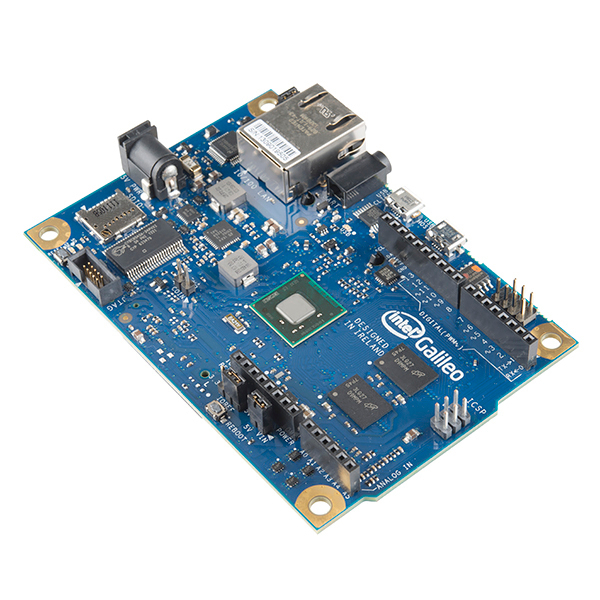 In addition to Arduino hardware and software compatibility, the Galileo board has several PC industry standard I/O ports and features to expand native usage and capabilities beyond the Arduino shield ecosystem. 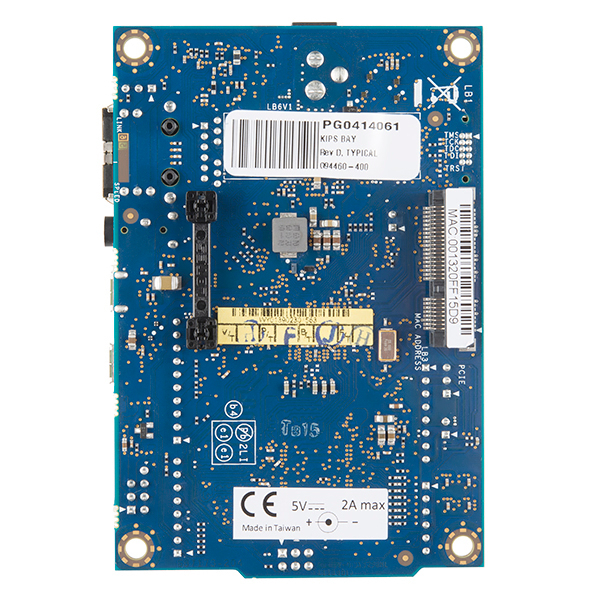 A full sized mini-PCI Express slot, 100Mb Ethernet port, Micro-SD slot, RS-232 serial port, USB Host port, USB Client Port, and 8 MByte NOR flash come standard on the board. 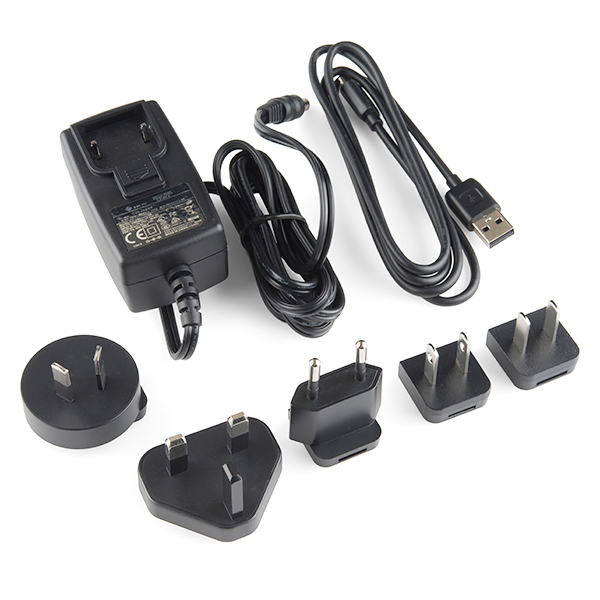 Note: The Galileo does NOT come with a USB microB cable, this will need to be purchased separately. We are currently updating our photos to reflect this change by Intel®. 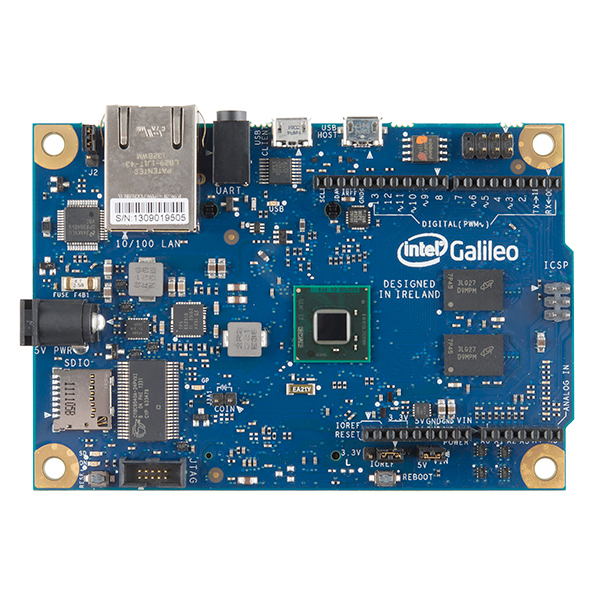 Intel Galileo is compatible with 4D Systems display modules using the standard Arduino Adaptor Shield, allowing it to communicate to basically all of the 4D Systems display module range, Goldelox, Picaso and Diablo16. So product like this: https://www.sparkfun.com/products/11741 and this https://www.sparkfun.com/products/11740 are compatible. I have this kit. I am just shooting a warning out to anyone who wants to do high speed SPI or I/O twiddling. This kit wont do it. All the I/O is sent through a I/O expander IC. There is NO access to any of the processor I/O lines. Its is a neat device but the designer killed it by do this. I have to disagree. Though I'm not sure what Intel was intending on adding to the Arduino line-up with the Galileo, what they did add was a board with some serious number crunching horsepower, I/O lines that make it easy to prototype (5V tolerant lines, Arduino shield compatible), and is easy to code for. I haven't found another board with ALL of those things. If there is another out there, please educate me. Arduino Yun comes pretty close. No 3v/5v select as far as I can see, but CPU power is comparable, and it's already got wifi built in (though having an open PCIe slot on the Galileo IS pretty awesome...) And since you've got an ATMega on the Yun taking care of I/O, you can get real-time I/O performance, hardware-supported I2C and SPI, etc. Not true, please read this about fast I/O pins on this board that can reach between 477 kHz and 2.93 MHz. I must admit... I feel mixed feelings about this. Compared to an Arduino it certainly seems like a capable board, but it seems lacking compared to a Raspberry Pi or a Beagleboard. ESPECIALLY for the price tag. And I have to use an I/O expander? That doesn't seem like they thought the design through. On the other hand... this is an x86-based board meant to be Linux compatible. Compared to the R-Pi and Beagleboard this could MAYBE guarantee more "mainstream" support from upstream. Ultimately, I'll pass, wait to see if Intel will make a followup board with comparable specs to an R-Pi at half this MSRP and NOT force the use of an I/O expander. Might be more worthwhile to invest in a high-end Arduino or an R-Pi/Beagle. Please don't get fooled by some of the comments mentioning that all I/O is sent through I/O expander IC. This thing has actually two "fast I/O" pins that go directly to Quark chip; for these pins, changing value is merely a bit shift in memory. The board is also quite reliable, mine has gone through quite some abuse, including shorting, connecting incorrect power supply, falling down from the desk, etc. and yet it still works flawlessly. I also own Galileo Gen2, which has actually 6 fast I/O pins instead of 2, but I like Gen1 more because of 5V supply and smaller dimensions. I'm using these boards for scientific work. Keep in mind that there is also a libmraa library you can use with this board. My friend is going on in Albany this duarante five days, you give the hotel? How many days for delivery? This depends on the shipping method you choose. We also do ship world wide and have distributors world wide. Please email customerservice@sparkfun.com and they can help you figure out the best way to get one of these. Does anybody know if the Galileo Gen 2's Arduino header pins are being controlled by a different chip? On the Galileo, those pins are being controlled by a separate chip, which means that those pins cannot be clocked higher than a certain speed (I don't remember what that was, but I know it was too slow to use SoftwareSerial library). I hop the Gen 2 either uses a different chip that can clock those pins much faster, or hook those pins up directly to the Quark. At the bottom under the "Whats new with the IntelÂ® Galileo Gen 2 board" section is says "12 GPIOs now fully native for greater speed and improved drive strength." I hope that means it can drive the Arduino header pins much faster to be able to use libraries like the SoftwareSerial library. Hey, SparkFun, I was wondering if you were ever planning on picking up the Galileo Gen 2? Picked up one of the gen 2 boards today at a local shop. I was hesitant at first but grabbed it anyway. After watching a few videos on Intel's website I'm pretty blown away. Search for: Getting Started with the IntelÂ® Galileo Board Using Sparkfun's 3.3v FTDI board, I could telnet directly into the underlying Linux distribution. Plugged in a stray 16GB micro SD card and had ethernet, storage and pretty good memory available to a bunch of Arduino sketches. Pretty cool! Has anyone made something with this yet? I have. I've made a login system using RFID tags. When somebody swipes the tag, the Galileo queries an SQL database hosted on my computer and records peoples' clock in's and clock out's, and even displays their name on an LCD. Of course I've tried doing this on an Arduino Uno, but it kept freezing. I think the Uno just didn't have enough SRAM to handle such a large program. I could've had the Galileo host the SQL server, but that would've been a bigger chore setting it up on the Galileo than my computer. 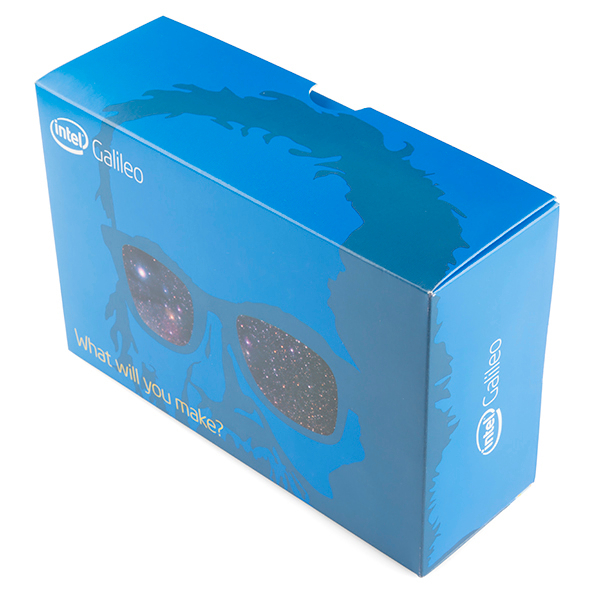 Any ideas if buying "Intel Galileo Wi-Fi Kit" will help me use it to pair with Bluetooth devices? I am trying the same clock in's and out's with a BLE device. For anyone looking at the Galileo I'd suggest looking at the Arduino Yun as well. I found the Galileo to be quite a chore to get working including having to make the special serial cable, getting the better linux distribution, buying the usb/serial cable, the challenging performance of the arduino side. On the other hand I had the Yun up and going in no time at all. In conclusion, unless you have a compelling reason for using the Galileo I'd suggest you consider the Arduino Yun. Yup, I agree completely! I recently bought a Yun, and it has been so much easier setting up than the Galileo. The only problem I have with the Yun is that the SPI pins are broken out onto the ICSP header. So if you have a shield that uses SPI, well you better hope it also has the SPI pins broken out onto a female ICSP header to interface wth the Yun. I was using the Galileo at first to host an SQL server, and that worked pretty well, but getting it working completely with all of the other hardware I was using with it was a chore. I was able to get the same exact project working perfectly in a fraction of the time with the Yun. I just hope the Galileo Gen 2 will be much easier to use. I think Galileo is a wonderful stuff and we have make an USB to RS232/TTL converter to connect it, you can go to www.goembed.com to learn more details, wish you have some fun. Has anyone used this with Windows Embedded Standard 7 or Windows CE? I have WES7 and can not get the galileo working. The drivers fail to install, then after going to the folder (per the install guide) the file usbser.sys is not located in either the "drivers" or "DriverStore" directories. Depending on the method I take to install the driver, I get either an "inf" error message, or driver up to date message. Either way, I still show a trouble icon in my device manager for the Gadget Serial V2.4 port. Any help getting this to work on WES would be appreciated. Can I power this with POE? Does anyone know what the floating point performance is out of it? I find it more interesting to have a cheap development board with ah hardware floating point than anything else. 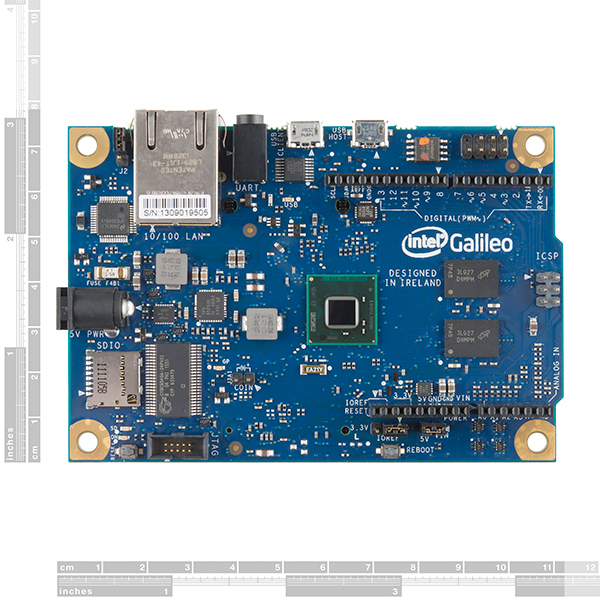 "The Galileo runs Linux straight out of the box, and has the ability (unlike others) to multitask while operating an Arduino sketch-- this opens up a world of new opportunities for your projects." Now I can totally understand that the IDE will compile the sketch as a user-level executable that will run on the included Linux distro a a regular process...but does that mean that I can load more than one? Do they get like a name or something and then I can ssh into the board and fire them off? A scada programmer here. So, first, do you have one of these boards? Secondly, using IDE can you upload more than one app and run them at the same time? How about interrupts for monitoring sensors, adc, digital i/o can you run them with shared memory pickup data and display it? I do realtime control and data acquisition stuff. The headline here is definitely x86 which makes it now possible to economically port some older software. Note that this is a Pentium class chip. That sounds good to our modern ears used to Pentium 4's and the like, but it is not that architecture. The Pentium name here would seem to mean that this is compatible with the Pentium that came before the Pentium Pro (1993). That said they have baked in a lot of peripherals to make the chip stand well on its own. This means if you want to put an OS on the board you will be limited to DOS or an embedded OS, but you should be able to accomplish a lot with a true embedded OS. Microcenter sells it for $39.99 ($59.99 - $20.00 coupon) "goolge intel galilieo coupon". Did this and it works, now what do I do with it? I have a gameduino v1 so that may be my next project, I always ran into ram limits on the 328. If I can get the compile to work it might be cool. So this board seems fairly good, though to anyone who is looking to use it in a high power applications I suggest that a rasberry pi or beaglebone black be used for a couple reasons. To answer a few questions, the board is x86 compatible and runs at up to 400mhz, the clock speed is variable and the cpu is single thread only; fairly on par with current boards. The ram is surprisingly good, from the datasheet it seems that it is 512kb SRAM on the CPU with 256mb DDR3 available aswell. It will run DOS, though as there isn't a GPU (from what I can tell) there won't be a tiny XP laptop anytime soon. The graphics chip on this isn't really mentioned anywhere so I suspect there isn't really one to speak of. Something to bear in mind for portable applications, something like the nokia serial LCD or sparkfuns Grapics LCD series will be fine. Anything using lots of pixels and in colour will be slow. As Member #38914 said, the processor I/O lines are not available and everything is through an I/O expander, larger applications using lots of modules and displays will lag quite a bit. Having said that this board will do mostly anything, including SPI and I2C. Its only limitation is the amount of pins available, and as said earlier there is already an I/O expander in use so adding a second will be a lot like adding a usb hub to the rasberry pi. The board itself is pretty good, its main drawcard is that it is not an ARM board so any applications that require the x86 instruction set will work. I suspect intel meant for this to be used in legacy applications where lots of old and archaic hardware is used, such as mining where oftentimes older hardware is required to monitor expensive equipment. For those looking to make anything where the main interface is a colour monitor or lots of I/O pins are used then use a Beaglebone Black, for tons of support and the ability to run a web browser the Pi is the better option. I will say one thing, for $80 the price/performance is very lacking. Much of that cost was probably from shrinking a pentium down that much. The clock speed's actually misleading, though. Although it runs at a higher clock speed than most Cortex-M3 and M4 boards, many common arithmetic operations take far more clock cycles than on Cortex-M3/M4. For example, on paper the Galileo is actually slower at integer multiplication than the Arduino Due - it's one clock cycle at 84 MHz on the Due, but between 5 and 12 cycles at 400 MHz on the Galileo depending on the values being multiplied. Bit shifts, rotates, and integer division all take several times as many clock cycles on Galileo too. The Due doesn't have hardware floating point, but the Cortex-M4F boards that do (like the STM32F4DISCOVERY) apparently beat it even more comprehensively and spectacularly at floating point operations. I expect Cortex-A series SoC are even more impressive. Some questions, I know most are in the Datasheet, but would be nice if it was listed here. Is this real-time? What is the processor speed? What about floating point vector math? RAM? What is the Linux stuff I read, I don't get it. https://communities.intel.com/thread/45225 That should answer your questions. It's got an RTC, It has a 400 Mhz x86 core with 256 MB DDR3 RAM, you can also add in a mPCIE GPU if you want. "so we recommend not including any other items on the order"
Can I include a humidity sensor with this vaporware? Seriously, why is this even here? The product doesn't exist, no one knows what it actually does and no one knows if/when it will ever be available. If this wasn't Sparkfun, I'd say it was some kind of a scam , but this company's too honest for that. So I'm puzzled. As for the Arduino Yun in some way, I'm very confused about this board. The main question I have is "why the heck should I buy this expensive board over a 35$ RPi"? Sure, I sounds awesome, but I got 3 RPi and one first-gen pcDuino, and the latter is arduino compatible too. One nice things though is the 5V switch: nice! But the lack of HDMI port is completely stupid. To me, at least. I think we need a comparison chart between pcDuinos, RPis, Beagle boards and such to see clearly through all of this. It's got a x86 core, so it can run x86 OSs and it's more powerful than the RPi or any other single core ARM board. Since this thing is described as a "32-bit Intel PentiumÂ®-class system on a chip (SoC)." is there any chance that it would run DOS, or another x86 O/S? I'm really not clear on how/why someone would use this vs. another Arduino style MCU (aside from the ports/expandability on it) and/or why it's important to know that it's an x86 machine, so long as we're programming it w/ Arduino sketches... What am I missing? I'm still trying to understand this board as well... but it sounds like they are targeting this as an Arduino board emulator, which has performance upgrades (at least I expect so): like faster instruction execution, memory access etc. From reading, it sounds like there is some version of Linux which will 'run' your sketches on the device (the Arduino emulator?). I am glad I am not the only one having an issue identifying the purpose of this. What is the advantage of using this over an RPi for example? Why would I want to use this instead of an Arduino? I can see one advantage - the mini-PCIe slot lets you put decent Wi-Fi in there. Maybe I've just had rotten luck, but I've yet to find a USB Wi-Fi adapter that wasn't awful... Aside: I wonder if there's any supported way to put storage on that PCIe bus? The alternatives tend to top out at SD, or eMMC if you're lucky. Yes.. I guess I can see the advantage if there's a DOS app or something I want to port to this, and take advantage of the formfactor or a specific shield, etc.. I'd also suspect there's a speed advantage, even if you're going to just use Arduino sketches, but I just can't help thinking I'm missing the big picture here..